FOR the past few weeks we have been looking at the Afro-Asian conference that took place in Bandung, Indonesia, in 1955. It was a historical event that set a tone of African-Asian liberation and co-operation. China is a success story because it managed to actualise many of the recommendations of the conference. It retained its culture as well as traditions and bases its national holidays on them. This is not the case for most regional members that only recognise colonial festivities as holidays such as Christmas, Easter and New Year’s Day. China retained its traditional lunar calendar and continues to observe and determine days such as the New Year, according to the moon phases. China also observes festivals like qing ming which are identical to our kurova guva or mapira ceremonies. These have been vilified by Western religions in Africa and are rendered informal and even sacrilegious. The Chinese use their own characters and language in schools and at work. They are leaders in technological research and development and offer scholarships as well as training to other African and Asian countries. China is well-versed in atomic energy and yet it does not partake in using nuclear or thermonuclear technology for armament purposes. In 1955, when the Bandung Conference was held, China was in a dreadful state. It was sanctioned by the West for fighting the US in the Korean War and was isolated from the rest of the world until the 1970s. In a short space of time, China managed to rise from a poor and underdeveloped nation to the fastest developing nation in the world. Today, China is a world leader in many fields and has become a role model for other regional members. After the Bandung Conference, many more similar attempts to bring prosperity, solidarity and interconnectivity between members of this region took place. The most notable was that of the Non-Aligned Movement (NAM). NAM was founded in Yugoslavia in 1956. It was a direct response to the North Atlantic Treaty Organisation (NATO). NAM is therefore a collection of nations that are not part of NATO and are not aligned to any major power bloc. It is much larger in terms of geographical area and population. However, NATO is a collection of nations that have been infamous for domineering and partaking in imperialistic endeavors including kidnapping, enslaving, colonising and exploiting Africans and Asians. NATO has nations like the US, UK and France who are likely to be involved in offensive wars than all other countries in the world. The 28 members of NATO struck agreements to assist and ally with any member that gets involved in a war and to never declare war on other NATO member-nations. This means any nation which fights against any member of NATO is under the risk of facing all 27 other member-nations in battle. They share funds, intelligence, troops and armament and have been bullying the rest of the world, be it diplomatically or physically, through warfare. Because of NATO, many European nations partook in infamous wars such as the US-Iraq war that took place at the beginning of this millennium. It was just a matter of time before non-NATO members were to come up with the initiative to collectivise and form the NAM. The NAM was founded at a time the imperialist nations of the West were at odds with the socialist and communist nations of the east. This was a good and necessary initiative which saw nations of Asia, South America and Africa coming together. Non-NATO nations that do not have NAM membership are classified as observers. However, the movement has not proved effective in assisting other regional members at war times. This is because NAM members are not as savage and war-like, and do not invest in, nor rely on, war as much as NATO members. Resource-filled continents like Asia, Africa and South America have everything to lose when attacked yet Europe is a desolate land with nothing worth fighting for because the few resources that were there were depleted long ago. This explains why the initiative for war mostly comes from the West and not the East. Another similar movement which took place the year after NAM was formed was the Afro-Asian People’s Solidarity Organisation (AAPSO), founded in Cairo, Egypt, in 1957. The purpose of this forum was in line with the Bandung Conference resolutions and those of NAM. This shows that in the 1950s, pan-Africanism and the dream of regional unity and co-operation was widespread. It is disappointing to note that, although well-intentioned, these organisations are mostly ceremonial and have few notable successes. When it comes to stopping or preventing the regional members from being attacked by the West, these organisations behave as lions with no teeth. The African Union (AU) was founded in 2001 as a replacement to the Organisation of African Unity (OAU), founded in 1963 in Addis Ababa, Ethiopia. It was meant to unite Africa and to also counter the European Union (EU) in all respects. Unfortunately, the AU has also proved to be a ceremonial giant which has time and again failed its member-nations by failing to come up with solutions to African problems. As it stands, the AU is not at all comparable to the EU. The EU members have a common currency that is called the Euro which can be used in all European nations besides their local currencies. This currency is internationally recognised. They also have EU passports which allow members to travel throughout Europe without difficulty. The EU also has trade co-operation policies while goods produced in any European country can be sold in all other European nations with ease. This is not the case with AU which has not managed to form a common currency, has no AU passport and no trade co-operation policies. In many cases, the AU has been used to further the interests of Western nations in Africa. This is often done through the United Nations (UN) whose permanent members to the Security Council comprise mostly the same nations of the West which are taken to warmongering. For example, the AU now sends troops from Kenya, Burundi and so on to man Somalia, a role that was taken by the UN and US until their humiliating loss to Somali civilians in the early 1990s during the Bill Clinton era. This has led to tensions developing between Somalia and her neighbours who would not have been involved if it was not for coercion by the UN and funding from the West. The AU also took the West’s advice to sanction Eritrea for not supporting the US-backed transitional Somali government. Such internal feuds between African nations would not have taken place if the AU stuck to its mandate to prevent disputes among members. Regardless of the ineffectiveness of such movements in assisting regional members in war times, nations like China have stretched out their hand to train and arm regional members that have been militarily attacked by the West. These nations include Zimbabwe which sent several of its children for training in China during the liberation war against Britain and the settler regime. 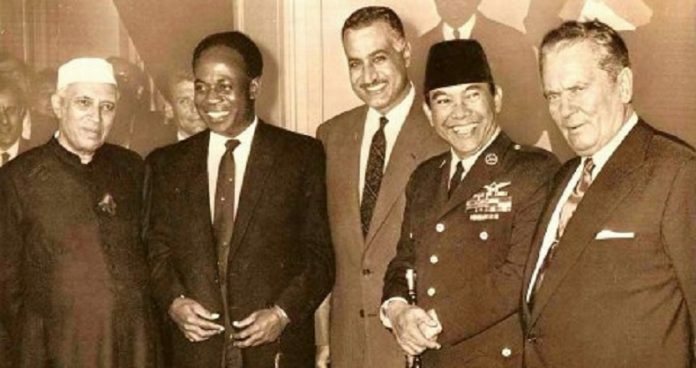 It is evident that the Bandung Conference was the start of many other attempts to develop and protect the lands of Africa, Asia and South America. The idea of the world’s indigenous people coming together, without the attendance of Westerners to discuss matters of mutual interest is mind blowing. It motivated black leaders and revolutionaries, such as Malcom X who often taught about the Bandung Conference to his audience in the US. It also motivated Africans, such as Kwame Nkrumah, who was one of the five people behind the founding of the NAM.